The equestrian community received a wonderful opportunity from the Maryland Department of Agriculture to be an active participant in the creation of a standing Maryland Equine Health Advisory Committee. Both the task force and the resulting committee are outstanding examples of the positive results of a partnership between private industry and interests and public officials and interests, and we hope that this will serve as a model for future such partnerships. The task force has created a solid blueprint for the creation of an effective MHIB Equine Health Advisory Committee. The purpose of the Equine Health Advisory Committee is to represent the concerns of the equestrian community as they relate to state oversight and regulation of equine health issues. Although the EHAC will report directly to the Maryland Horse Industry Board, it will also serve as an important advisor to the office of the state veterinarian and the Secretary of Agriculture on the issues of concern in the equine industry. It is our hope that the eventually appointed members of the committee will take their responsibilities very seriously and will be dedicated not only to effective crises management but will also be dedicated to the equally important, albeit more mundane business of routine regulatory issues that are essential for eff ective health management and industry commerce. We urge MHIB to appoint committee members with vision and creativity — with the vision to look beyond the immediate issues of today to foresee how an issue not a problem today could become a problem in the future, and the creativity to off er practical, implementable solutions that can help improve the future of equine health management in Maryland. In order to foster a committee that is forward thinking, the task force has taken pains to construct a blueprint that, if followed, will help to ensure that productive dialogue. This task force and subsequent Equine Health Advisory Committee was born out of an equine health crises in Maryland. Although it is listed as part of the responsibilities of EHAC, it is vital that the committee immediately perform a thorough assessment of the current reportable diseases, and advise on how this list should be updated. including the possible implementation of electronic filing as well as exploring ways to give the Coggins test oversight system more credibility in the eyes of the general equestrian public. Other topics too specific for the blueprint were the establishment of a fund to cope with catastrophic equine health events and a study of potential health issues associated with the wild pony population on Assateague Island. D.V.M. (Animal Health Sec- tion, Maryland Department of Agriculture); William P. Higgins, D.V.M., Ph.D. (Animal Health Section, Maryland De- partment of Agriculture); Shari Kennedy, D.V.M. (Southern Maryland Equine Veterinary Service Inc., Maryland Horse Council); Crystal Brumme Kimball (Th e Equiery, Maryland Horse Council); John W. Lee Jr., D.V.M. (Unionville Equine Associates P.C., Mary- land Horse Industry Board, Cecil County Equine Industry Task Force); Amy Polkes, D.V.M., D.A.C.V.I.M. 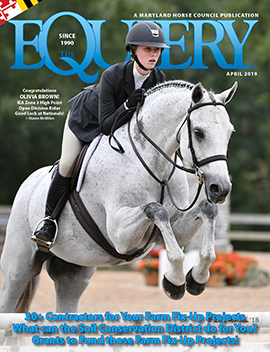 (Damascus Equine Associates); and Eleanor M. Trueman (Trueman Communications Group Inc., Maryland Horse Council). The purpose of the Maryland Equine Health Advisory Committee is to advise the Maryland Horse Industry Board and the Department of Agriculture on matters of equine health and disease in the state. Th e task force created a structure for the committee that balanced the need for representation of the varied and vast equine interests in the state with a workable size group that can be effective. Making up the final committee will be representation from each of the following groups or interests: the Maryland Veterinary Medical Association, the Maryland Association of Equine Practitioners, the Virginia-Maryland Regional College of Veterinary Medicine Avrum Gudelsky Veterinary Center at College Park, the Marion duPont Scott Equine Medical Center, the office of the Maryland state veterinarian, the University of Maryland School of Agriculture and Natural Resources, the Maryland Cooperative Extension Services, the licensed veterinarian from the Maryland Horse Industry Board, an additional member from the Maryland Horse Industry Board, a licensed stable operator who is a member of the Maryland Horse Council, and an additional member from the Maryland Horse Council. At least two members should be in private veterinary practice. Members will service staggered four-year terms. Th e Equine Health Advisory Committee is tasked with ensuring the establishment and implementation of effective industry and community communication vehicles, and with review and advising on state policies and protocols regarding reportable diseases (are current regulations adequate? Does the list of reportable diseases need to be added to or amended? ), state statutes and regulations relating to equine health, interstate health requirements, the capabilities of Maryland State Animal Health Diagnostic Laboratories, and emergency preparedness protocols.